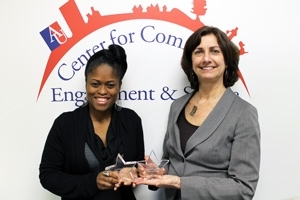 Adams (left) and Campos received the Septima Clarke Empowering Children and Communities Award from local nonprofit nonprofit MOMIE’s TLC. Photo by Patrick Bradley. Two glass stars glimmer on the shelves of Marcy Campos and Robin Adams in AU’s Center for Community Engagement & Service. The stars represent the fruits of a long-standing community partnership with local youth mentoring and tutoring nonprofit MOMIE’s TLC. After seven years of collaboration that has brought scores of AU students to MOMIES to support literacy, learning, and other efforts, the group honored Campos and Adams with their Septima Clarke Empowering Children and Communities Award. Adams, assistant director of the Center for Community Engagement & Service (CCE&S), believes they received the award for their shared vision of what it means to help the District of Columbia’s youth. CCE&S currently has 20 AU students tutoring MOMIE’s some 80 kindergarten through high school youth five days a week at their Brightwood center in northwest DC. AU also supports the organization through one-day service events throughout the year as well as over the summer, as AU students volunteer as counselors at MOMIE’s educational camp. Proceeds from the campus’s end of semester Project Move-Out sale have gone to the group as well. Chitra Subramanian is deputy director of MOMIE’s TLC, which stands for Mentors of Minorities in Education’s Total Learning Cist-Tem. She’s also an AU alumna, having graduated in 2005 with a master’s degree in arts management. During her time at American, she worked with MOMIE’s as a volunteer through CCE&S, eventually landing a full-time staff position at the nonprofit after graduation. According to her, she’s not the only AU eagle connected with MOMIE’s that’s been significantly impacted by volunteering with the group. To Adams, Subramanian’s rise to her current post shows another educational – and professional – benefit to the shared vision between AU and MOMIE’s. Working with MOMIE’s provides an opportunity for students to explore issues of diversity and how they relate to education, and the support as students explore has allowed MOMIE’s to reallocate resources enough to recently open a second location in Maryland. MOMIE’s itself received the National Arts and Humanities Youth Program Award from the White House in 2010, and when AU made the President’s Higher Education Community Service Honor Roll this year for the seventh time, it was – as Adams says – due in large part to the work with MOMIE’s. Of the many nonprofits Campos and Adams work with, it’s clear that their relationship with MOMIE’s is a special one, and the stars on their shelves are just the final touches – for now – on what makes this collaboration such a powerful one for all involved.